It is possibly one of Cape Town’s best kept secrets. A five-star luxury lodge in Table Mountain National Park at the foot of a precipitous mountain drop on the very edge of the ocean. You turn off Chapman’s Peak drive, conveniently twenty metres before the toll collection gates. 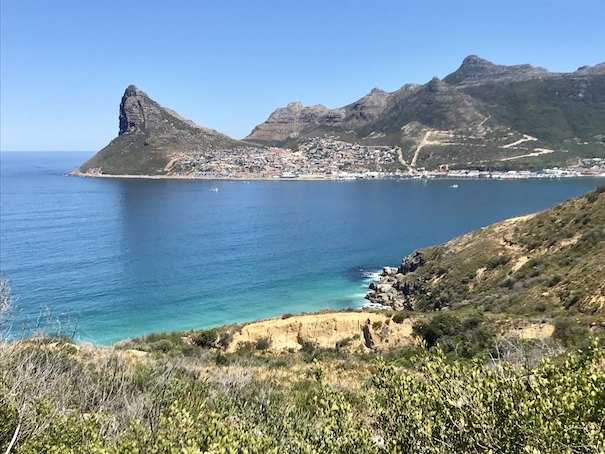 From the gravel parking lot, you are fetched by the Tintswalo Atlantic shuttle, whose driver, like a good harbour pilot, knows how to navigate the treacherously narrow road with its hairpin bends. As you descend, you might think of the Isle of Capri if it wasn’t for the lush protea and erica fynbos. When I visited in 2016, the surrounding landscape is well on its way to recovering from the terrifying fire of March 2015 that devastated a great swathe of the peninsula. The fire burnt right down to the water’s edge. There wasn’t much left of Tintswalo – only ashes really, some bedsprings in the debris, chunks of melted silver; the ancient milkwood trees, once a hallmark of the place, were burnt out and sadly had to be felled. But a year later, Tintswalo had risen like a phoenix – which is now the insignia on the staff uniforms. As someone who in a past life had a guesthouse that burned to the ground, I can appreciate the pain of renovation by fire. However, it does afford the opportunity to make improvements. The new layout is spacious and open plan, leading you in one swoop from the front entrance through the lounge, bar and sundeck, onwards to the dining room and to the chalets. Milkwood trees have been replanted, but in more convenient places (the lodge used to have to be built around them). The melted silver now sits quietly in frames, reminding one of the place’s baptism by fire and perhaps the evanescence of material goods. It was wonderful to return after another two years (2018) and see how well the fynbos and the mountain have recovered despite the drought. The facilities are, as one would expect, top quality, but Tintswalo nourishes much more than one’s corporeal needs. Everything faces directly onto the iconic Hout Bay Sentinel rock across the water, perfectly positioned for breath-taking sunsets. If you’re as lucky as I was you’ll see pods of dusky dolphins frolicking. They love to surf close to the coast, and in season, you can see Southern Right Whales breaching in the bay. It would be remiss not to mention that disguised in that view is the hard world of Dontse Yakhe informal settlement and Imizamo Yethu on the Karbonkelberg. But such are the contradictions with which we live in South Africa. If one scrambles over the granite rocks, there is a very private, tide-dependent beach sandwiched between the giant boulders that make up this bit of coast. Closer to the lodge is a plunge pool and on the pebble beach a hammock to loll in. The pebbles are a feature themselves, rolled smooth by the tide, they lie in a gorgeous mix of mauve, russet, fawn, ochre, blue grey, obsidian black and some are also perfectly white. Situated in a bay and secluded from the wind by the mountain, the Atlantic is often a calm, tropical turquoise. There are ten individual suites done up in a “shabby-chic” style with island themes – such as Ithaca, Java, Lamu, even Robben Island paying tribute to Nelson Mandela, while the two-bedroomed Presidential suite has Napoleon in mind with Elba and Corsica as its themes. All of them are the epitome of luxury with king-sized beds, supremely efficient ceramic fireplaces (by accident I melted my Samsonite case next to it! ), air-conditioning and voluptuous baths. If that isn’t enough, one can order spa beauty treatments and massages. 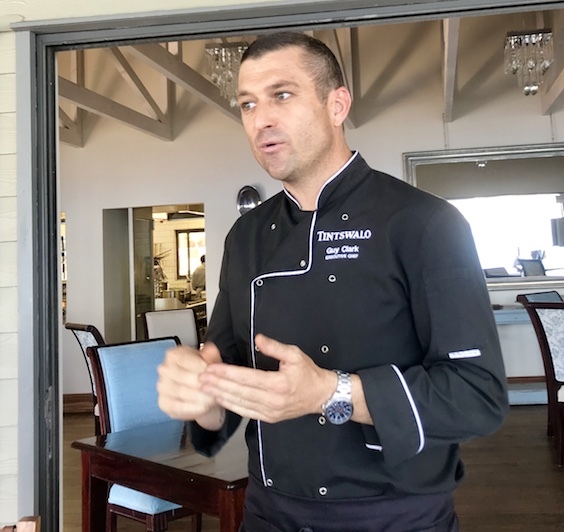 Even better, for vegans, Executive Chef Guy Clark has launched a four-course tasting menu (R650 pp), available for lunch or dinner to tables of a minimum of two vegan diners. It must however be pre-booked. 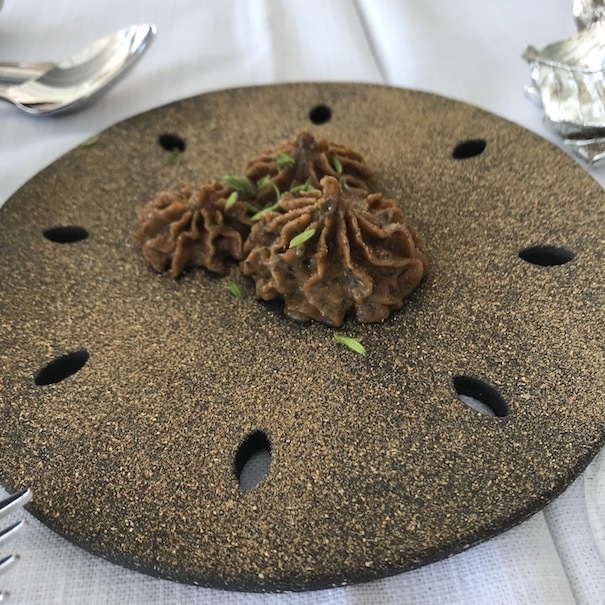 To start with a glass of bubbly Paul Rene Brut Rosé and Clark’s take on babaganoush – quite sweet with very little smokeyness, but a rich mouthfeel of aubergine and home baked bread. 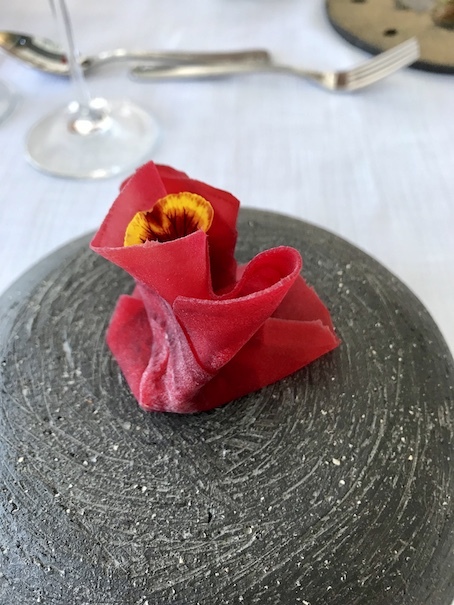 The amuse bouche was a ginger and apple mousse in a beetroot wonton, whimsically made from a viola flower and not pastry. 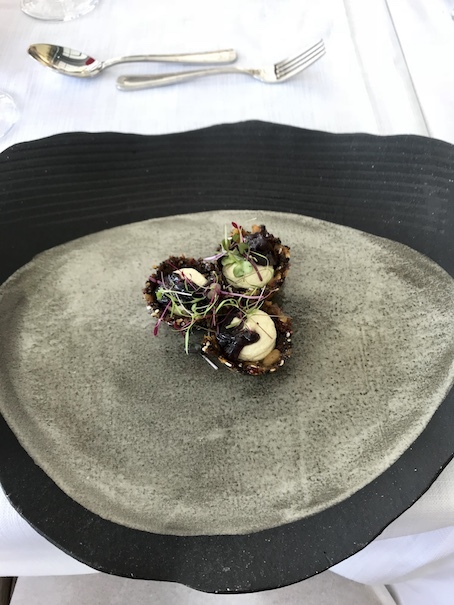 The starter was savoury cashew ‘cheese’ cake with red onion and micro greens in a basket that was jammy, almost figgy. 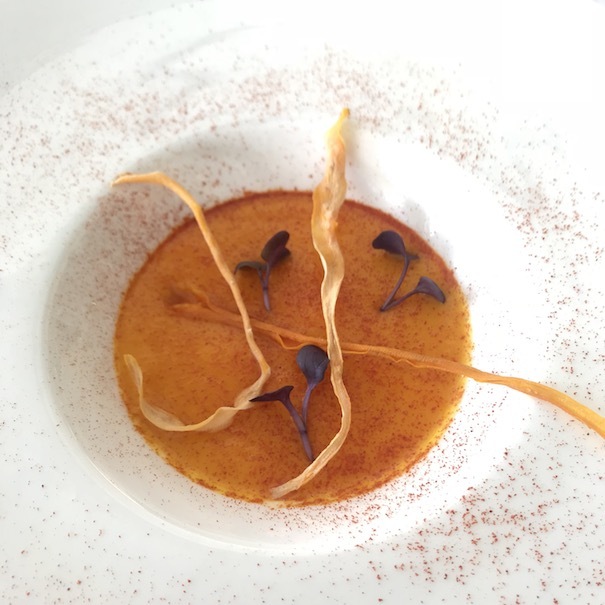 It was served on a bespoke handmade plate with such a beautiful delicate glaze one wanted to scoop it off with a spoon and eat it. 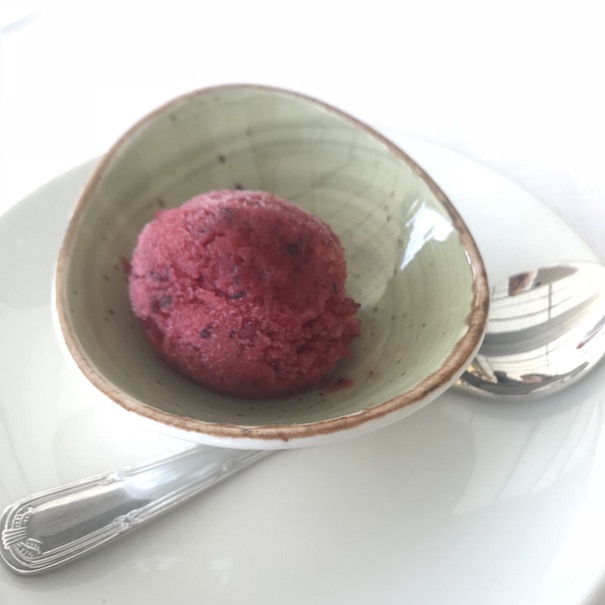 To freshen the palate there was a choice of litchi or red berry sorbet with a strawberry grain to it. 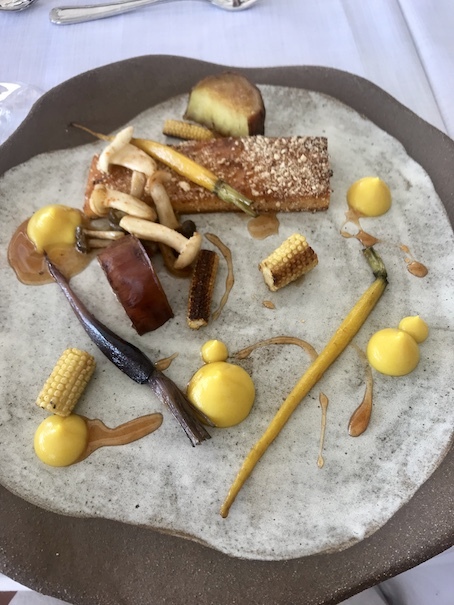 The main course on this very colour aware menu was a medley of yellows: Dukkah crusted polenta, reminiscent of a Colombian arepa, was served with rooibos poached sweet potato, parsnip and turmeric cream, heirloom baby carrots, cayenne spicy shimeji mushrooms, charred miniature corn and a rooibos and lemon jus. It was matched with a Ghost Corner Pinot Noir 2016. 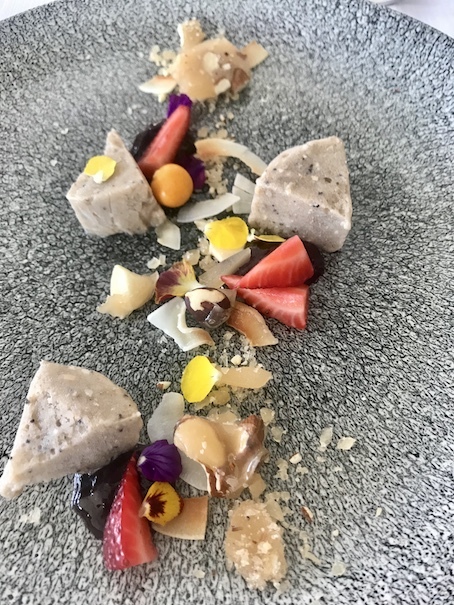 For desert a delicious banana parfait with nut brittle, toasted coconut flakes, berry gel and summer berries and to top the entire menu experience a glass of delicious Vin de Constance. Tintswalo Atlantic welcomes outside guests for breakfast (08:00 – 10:00), lunch (12:00 – 15:00, last sitting at 13:30) and dinner (18:00 – 22:00, last sitting at 19:30) – booking is essential. 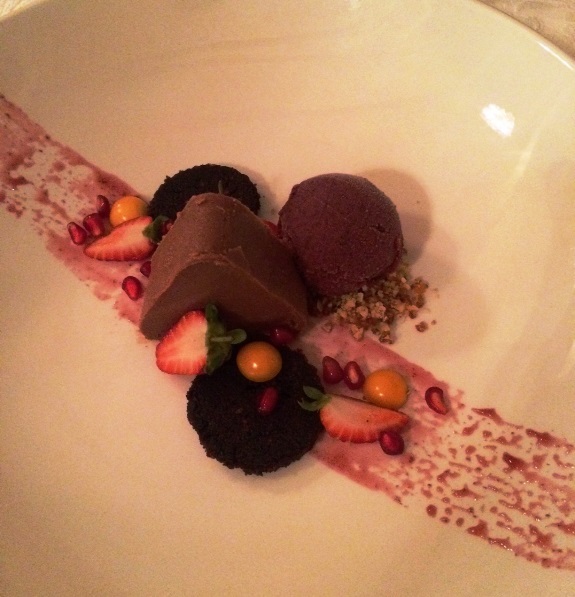 Last time I ate here, Chef Jeantelle van Staden produced an outstanding vegan menu including the most convincing and tastiest vegan chocolate coconut cheesecake I have ever had, with berry sherbet, walnut crumble, garnished with gooseberries and strawberries and served with a glass of fine port. Tintswalo has kept its standards high. After such spectacular lunches or dinners and a lot of wine, it is quite impossible to leave. The fireplace, the bed and ocean beckon. When I say the chalets are on the shoreline, readers might not quite understand. The bottom of the bed is no more than five metres from the water, and this is in Cape Town, not the Maldives. The Atlantic here has its very own sound. The tide rises rapidly by a metre or so, and one is lulled to sleep by the ebb and flow of the ocean and its soft percussion as the sea rolls and plays with the pebbles. Prepare for one of the more beautiful nights of your life.